"Absolutely the Best Free Windows Utility Software Ever!" 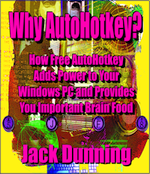 Download the FREE AutoHotkey e-books Why AutoHotkey? and AutoHotkey Tricks You Ought to Do with Windows! Available in EPUB, Amazon MOBI, and PDF formats. Get all three! Download FREE AutoHotkey scripts and apps for learning and generating ideas at the ComputorEdge AutoHotkey Scripts page. Includes descriptions for each script. Discover the benefits of ComputorEdge AutoHotkey Library Membership. In addition to deep discounts on books in all reader formats, gets numerous FREE Lifetime bonuses. Check out our ComputorEdge AutoHotkey Library Memberships. ComputorEdge Online is now dedicated to the Free Windows Scripting Language AutoHotkey, which should be a part of every Windows user's computing. It is the single most powerful and flexible tool for anyone who regularly uses Windows computers. Not only does it quickly and easily add valuable features to all of your Windows programs, but it keeps your brain nimble as you create and build new innovative ways to make your life simpler. "While it's simple to get started, AutoHotkey has the power to write full-blown apps, such as those shown on our AutoHotkey Apps page. What starts with a few simple Hotkeys and Hotstrings soon expands into an addiction—at least it has for me." For those wondering if AutoHotkey is right for them, this beginning AutoHotkey page gives an overview of the free Windows scripting language with examples of how it can help any Windows user. 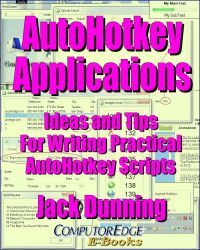 • AutoHotkey Versus AutoIt: "A Comparison and Review of the Free Windows Scripting Languages"
Not sure which free Windows scripting language (AutoIt or its offspring AutoHotkey) suits you best? They each have their own advantages. Check out this side-by-side review of capabilities. Ready to get started with AutoHotkey? Here is a quick start tutorial to get you up and running within minutes. • "What the Various Built-in AutoHotkey Graphic Pop-up Windows Look Like!" While the online AutoHotkey documentation tells you everything you need to know about the AutoHotkey Graphic User Interface (GUI) window controls (pop-up Images), it doesn't show how they look. take a glance at what they look like and how to use them. This introductory page may spark some ideas. We've accumulated a number of AutoHotkey scripts which demonstrate the various features of the free Windows utility language. Described on this page, downloads are offered for each one free. Unlike most other AutoCorrect features, the AutoHotkey AutoCorrect app works in any Windows program or Web page editing field. Easy to modify and tailor to your needs, this universal script offers many must-have tools to every Windows user. This page specifically addresses the Reminder app written in AutoHotkey code. Its iterations demonstrates a number of different capabilities. Jack uses this AutoHotkey QuickLinks script on a regular basis. He no longer needs to search for favorite Web sites or needed programs. A click of the first special mouse button (XButton1) pops up the menu which directly lauches his most used sites and apps. Since Dropbox has become so unreliable as a download page, the AutoHotkey Apps Page does double duty as the download page. Debuggng scripts often requires an understanding of how AutoHotkey processes a file. Sometimes simply moving code to the proper location in a script fixes the problem. 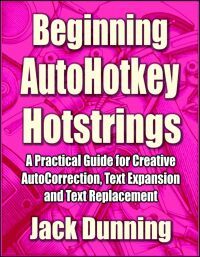 This page (plus the series Beginner’s Guide to How AutoHotkey Scripts Work found at Jack's AutoHotkey Blog) offers indepth discussion about how AutoHotkey does things. Regular Expressions (RegEx) offer power and flexibility to your scripts, but may give you a brain sprain. This introduction may help you decide whether or not to add RegEx to your AutoHotkey toolbelt. In addition to AutoHotkey (Jack's favorite), there are a number of other free Windows programs which will make your computing life easier. Check these out! Reading e-books on your computer or other device has never been easier. If you don't already own a free eReader, then take a look at these programs. No internet connection required when using e-books. Plus, many free offerings can be found. Learn more about how to read e-books with your computer or other device. While the Amazon Kindle uses a special format, the Kindle Fire can be used with most e-book formats. See this review for a comparison between the Kindle Fire and Apple iPad. My obsession with AutoHotkey has me writing a regular blog (at least once or twice a week). I'm now working with a WordPress blogging site to continue my AutoHotkey work. The best part is that WordPress is free and easy to use. I spend my time digging into the details of various aspects of AutoHotkey script writing. I've already explored the expanding topic of "Beginning Hotstring Techniques" and am currently working through a series on the alternative ways to work with Hotkeys. 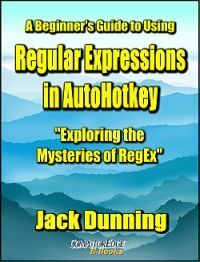 I added a couple more useful AutoHotkey Regular Expression (RegEx) examples (with more planned to expand on the book A Beginner's Guide to Using Regular Expressions in AutoHotkey), and will continue wherever the varied paths take me. While I'm doing a series of blogs on AutoHotkey topics, if there is something that you want to see, then either leave a comment on the blog or drop me a line at this special e-mail address. I will do my best to answer as promptly as possible. ComputorEdge Online is an AutoHotkey site exploring the use of the free open source scripting language in all versions of Windows. The goal of ComputorEdge is to help new AutoHotkey users to develop scripts for their Windows computers which will enhance their Windows experience and make them more productive. If you have Windows computers and don't use AutoHotkey, you should. It's not that hard and offers tremendous benefits. Plus, it's free. I've also started a different blog for everything non-AutoHotkey at BlogSpot (or Blogger). This serves my desire to talk about my other important thoughts. For the two people out there who are curious about what else I have to say, but don't want to be innudated with AutoHotkey, this is the place to go. While I won't have the pressure of weekly deadlines, I will be making regular contributions. If there is a particular topic you would like me to investigate, please leave a comment on the blog or use the special e-mail address. When ComputorEdge closed down the weekly magazine, many people have asked if I'll continue writing somewhere else. For those who want to follow the impact of the latest innovations from Apple and other technology companies, you can read my commentary at www.topbananas.com. 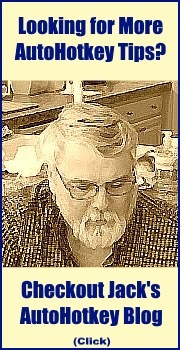 If you want to follow my thoughts on the e-book market, visit www.electronicauthor.com. If you're interested in what I'm doing with iOS programming, visit www.gamesforgeeks.com. Finally, if you're just interested in my story-telling and screenwriting ideas, visit www.15minutemoviemethod.com, if you like cats, visit www.catdailynews.com, and if you want to read my humorous writings, visit www.wallacewang.com. AutoHotkey Tricks You Ought To Do With Windows! This e-book includes both many tips and the reference material (Table of Contents and indexes) from the other five AutoHotkey books. Now in its third edition and Free! How to get it free! Originally based upon the series of articles in ComputorEdge, Jack takes you through his learning experience as he explores writing simple AutoHotkey scripts for adding repetitive text in any program or on the Web, running programs with special hotkeys or gadgets, manipulating the size and screen location of windows, making any window always-on-top, copying and moving files, and much more. Each chapter builds on the previous chapters. 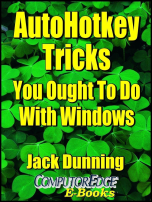 AutoHotkey introductory and overview book, AutoHotkey Tricks You Ought to Do with Window, available at ComputorEdge E-Books in the EPUB for e-readers and tablets, MOBI for Kindle, and PDF for printing formats. 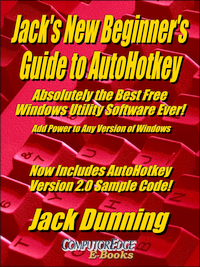 Jack's A Beginner's Guide to AutoHotkey, Absolutely the Best Free Windows Utility Software Ever! 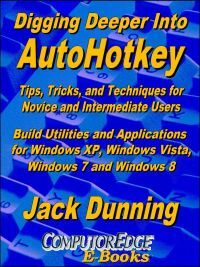 : Create Power Tools for Windows XP, Windows Vista, Windows 7 and Windows 8 and Digging Deeper Into AutoHotkey. Our second compilation of stupid ComputorEdge cartoons from 2011 and 2012 is now available at Amazon! That Does Not Compute, Too! ComputorEdge Cartoons, Volume II: "Do You Like Windows 8 or Would You Prefer an Apple?" Misunderstanding Windows 8: An Introduction, Orientation, and How-to for Windows 8 (Seventh Edition)! and That Does Not Compute!, brilliantly drawn cartoons by Jim Whiting for really stupid gags by Jack about computers and the people who use them.